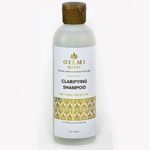 Oilmi Professional Shea Infused Clarifying Shampoo removes daily build up. The shampoo is infused with Shea Butter which is considered a super food for the skin and hair. This product should be used with the conditioner which will leave the hair with a shine.